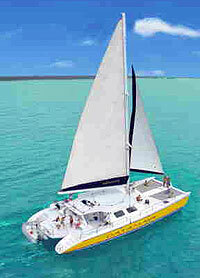 Charter your group a beautiful 65-foot sailing catamaran for the day and experience the bliss of paradise. Comfortable for groups of up to 100 people, this boat features big, spacious front netting for that ultimate catamaran experience, restrooms on board, and a big shaded area for those who like to keep out of the sun. There is easy water access for snorkeling, and a BBQ grill onboard to grill your favorite meal such as burgers, steaks, or lobster if you prefer. Located only about 20 minutes from Playa del Carmen, this catamaran specializes in half-day charters, both morning snorkeling trips and afternoon snorkeling and sunset combo trips. Of course the availability to grill lunch or dinner on board is a highlight but many people also prefer the lower cost of a cocktail cruise with all-you-can-drink open bar and snacks. A full crew will be on board to serve you all day long, pouring drinks, cooking food (if applicable), guiding you for snorkeling, playing music and leading you in fun onboard games, dancing and activities. Chartering this catamaran in Playa del Carmen is an outstanding way to make a great impression on your group this vacation! Departs: The Marina, about 20 Minutes South of Playa del Carmen. Directions will accompany your reservation.